Amongst the fantasy fans out of my group of friends, there are certain author names that seem to crop up a lot, regardless of the sub-genre or tone that these readers tend to plump for. Trudi Canavan is one of those, especially in connection to her Black Magician trilogy. So when I found that my younger sibling owned the first of her Age of the Five trilogy, Priestess of the White, I decided to see what all the fuss was about. 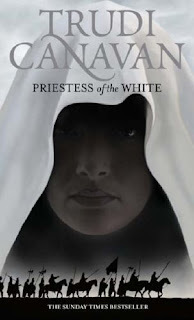 Priestess of the White follows quite a few groups of people, but primary amongst them is Auraya. She is a young priestess, talented both in her magical gifts and her ability to mediate, who finds herself chosen as the last of the White, a group of priests and priestesses hand-picked by the gods as their most powerful servants. While she is thrilled by the trust that her deities have placed in her, she finds that being one of the White brings up a lot more difficulties that she had ever expected. Firstly, she must prepare herself and the allies of the White for war when word reaches them of a great army being raised against them in the South of the continent, led by a cult who proclaim that the White worship dead gods. Secondly, she must try and reconcile her present role with her relationship to the only friend she has left from her days before entering the priesthood, Leiard; while she is naturally inclined to empathise and like him, he is a Dreamweaver, one of a cult that her gods have deemed blasphemous. There are a lot of things to like about Priestess of the White. Firstly, the characters are all really well-constructed with a lot of conflicting and paradoxical viewpoints. For example, there's Auraya. Her natural instinct is to encourage tolerance and acceptance amongst all the people that she can influence through peaceful means. But in her role as a priestess, she has to come to terms with the fact that she wants people to join her faith specifically, and the consequence that means that she will eventually cause her friend Leiard's way of life to die out completely, even as she preaches tolerance for his faith. With Leiard, there is his faith that Auraya will never knowingly hurt him or his kind conflicting with the equally strong belief that he will still come out second best if Auraya had to choose between him and the gods. And my personal favourite, Tryss, a member of a fragile flying sub-species of humanity, whose determination to give his people a means to defend themselves ultimately leads to him having to face the prospect of his family and friends going to war, despite their already low numbers. And each main character that the narrative focuses on has these kinds of interesting conflicts within themselves, where they have to figure out if what they want is really all they had hoped that it would be. Secondly, the setting is really detailed and interesting, with some unexpectedly grey morals and politics. For example, on the one hand, Auraya is obviously a good person and she does seem to genuinely want to help humanity in her position as one of the White. But on the other hand, you get hints and implications that the gods that she worships have ordered quite a bit of dirty work in the past, the impact of which still resonates in the form of the prejudice towards the Dreamweavers, despite their roles as healers. It does bring doubt into what she does for her gods, whether she or the other White truly understand the implications of what they are. Plus there's a lot of mundane politics that is really interesting, where the White have to change up their tactics in order to appeal to different nations and groups of people. I will say that while the plot is solid more or less throughout, there is a section around the halfway/two-thirds mark where it does seem to slow down as you then have to get through a lot of army management stuff. Not entirely tedious, but a bit of a drag at times I found. Still worth working through though.